The application that needs clean or sterile processing requires the use of a sanitary valve. The industries like food, dairy, pharmaceutical, medical and chemical generally need the use of sanitary valves. While selecting a sanitary valve do not forget to consider some significant specifications like the working pressure, the diameter and operating temperature of the device. You can easily measure the diameter across the inlet or outlet port. While the working pressure refers to the pressure at which the valve is engineered to function. Moreover, the operating temperature denotes the maximum level or the full-required range of operating temperature. Different types of sanitary valves can be configured to work such as liquids, gases, and liquids with suspended solids. There is an optimum range of temperature, which the valve can withstand and can work properly. The temperature is called material temperature. 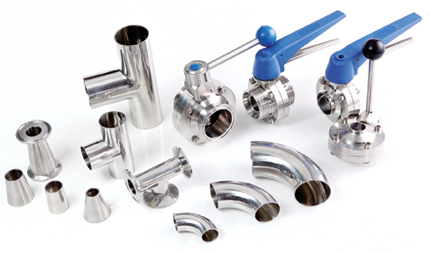 Firstly, the sanitary ball valves, mostly used for on/off control without pressure drop. The next is the sanitary butterfly valves which do the activity of flow regulation in large pipe diameters. Then comes the sanitary choke valve, effective for high-pressure drops found in oil and gas wellheads. The sanitary check valve let the fluid to pass through in a single direction only. The sanitary diaphragm valve often used in the pharmaceutical and food industry; the sanitary gate valve, chiefly used for on/off control, by low pressure drop; the globe valve, excellent for regulating flow; the needle valve, helpful for the activity of accurate flow control; the piston valve, useful for regulating and controlling fluids that carry solids in suspension; the pinch valve, effective for slurry flow regulation. And the plug valve, a slim valve efficiently used for on/off control however with some pressure drop. It is necessary for you to know the operating features of the valve as well. That means the metal from which it is prepared and the kind of end connection with which it is fitted. The functional characteristics and the material are the most important factors which affect the length and quality of service that a valve is expected to execute. While end connections signify whether a specific type of valve is appropriate to the installation. Prev: How to Select a Right Sanitary Check Valve? Next: How to Prolong the Service Life of Sanitary Fittings?